The seat of Mercy trinity just above the chancel arch is a very rare image. God is enthroned in the centre and on his knee a cross. This depiction of a cross on Gods knee is the only such representation known in England. The only other example can be found in Rheims Cathedral but is dated 1130 (this date being supported by documentation at Rheims) In front of the throne is the smaller image of Christ on the cross. By Gods head is a haloed dove, representing the Holy Ghost. To the left is a picture of the arc angel blowing the last trumpet, presiding over the dead rising from the graves on judgment day. 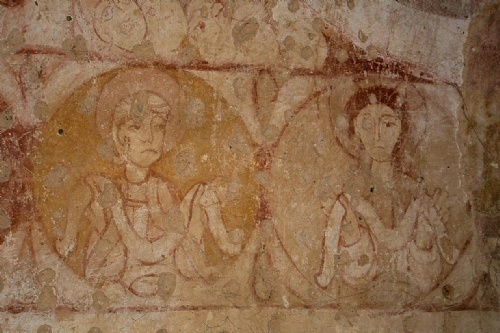 The circles (or roundels) show prophets holding either scrolls, napkins to carry the souls of the saved to heaven or dead serpents as a sign they have conquered evil. The main scene on the west gable shows the Harrowing of Hell and depicts Satan disposing of a sinner into a pit. Also worthy of a mention is the depiction of St Peter on Jesus right, he is looking rather miserable and sorry for himself, Having denied Jesus before the crucifixion. It is not until the 13th century he is painted with a happier disposition. Also in this painting the Angel Gabriel is shown without wing feathers on his wings, to distinguish him from the other angels shown, which is another strong indication to the early dating of this painting. The creation of Eve in the Garden of Eden is also present and includes the tree of knowledge. In this Adam is laying on the ground, whilst Eve is portrayed with her arms outstretched before her, hands clasped together in homage to God. Uncovered in the last restoration on the North wall is Noah’s Ark. On the Soouth wall above the door is Saint Christopher. Now the West wall has been cleaned there is also another doom painting on that, though not so clear.